I’m the first to admit that my attention span is waning drastically as I get older. These days I can only handle bite-sized snippets of entertainment at best; a five second YouTube video of a hamster giving a dramatic look, a cat parkour compilation set to the refrain of ‘Si Triste’ by French rapper 3 me Oeil, and the like. Anything longer is likely to result in me staring aimlessly out the window, twirling a lock of hair around my index finger and wondering what would happen if you tasered an elephant. 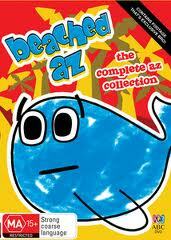 Which is why Beached Az is so perfect. For those habituating under a rock for the past couple of years, the series is based on a 90-second animated video, Beached Whale, that quickly went viral in 2008, garnering many millions of hits on YouTube. Concerning a whale who is ‘beached as, bro’ somewhere on the New Zealand coast, the concept has been adapted into a further 20 minute-long episodes, all of which are collected on this handsomely packaged and frankly rather hilarious DVD. Essentially an excuse for three Aussie writers/animators (Jarod Green, Nick Boshier and Anthony MacFarlane) to take the piss out of New Zealand accents at some length, Beached Az lacks a formal narrative structure, or anything approaching a plotline or cohesive story arc. Rather each standalone 60-second episode features the hapless mammal encountering a variety of marine life, indulging in a brief, often nonsensical conversation or breaking into song, before it’s time for the end credits to roll. 2) is it worth forking out $20 bucks or so a DVD of something I can probably just watch online? The answer to both questions is a resounding yes. The series remains whimsical, absurd and laugh-out-loud funny for the entire (admittedly modest) length of its 21-episode run, and there are a host of brilliant extras offering further inducement to parting with your hard-earned. ABC have provided a great treatment, and fans of slightly absurdist comedy will find much to love in this effortlessly engaging and rather cheeky little series. The show is presented in 16:9 widescreen, with a Dolby Digital 2.0 soundtrack. The transfer is faultless, and though the series features the most simplistic animation since 12 Oz. Mouse it nonetheless comes up a treat on DVD. You might almost say it looks sweet as, bro. There’s also ten minutes worth of Breakfast With Begerk, which this time around sees the Scots getting the old stereotype treatment. All in the name of comedy, of course. Again it’s very funny, and really gives those kilt-clad haggis-munchers the roasting they’ve so long deserved. Rounding out the extras are Director’s Commentaries on each episode; multiple language options on the pilot, including elfish (these are, as you may expect, not to be taken entirely seriously); theatrical trailers and original concept art. It’s a great swag that neatly compliments the politically incorrect but not entirely unaffectionate nature of the series.